The Gibbard Furniture Factory played a key role in fostering a sense of community in Napanee. That’s why the concept of community is at the core of Gibbard District’s philosophy. Designed to embody this concept, the district’s piazza is a central feature of the waterfront property. 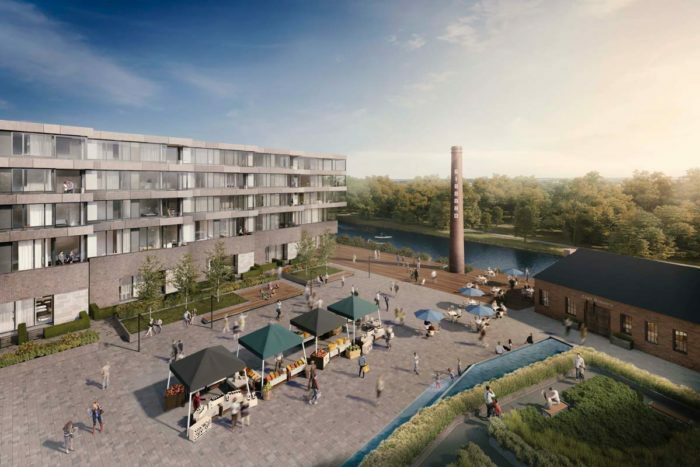 Created for Gibbard District residents and members of the public, the piazza will transform the town’s historic factory into a lively community space in downtown Napanee. Gibbard District’s piazza reflects the factory’s commitment to community in a new way. The pedestrian-friendly square at the heart of the development makes Gibbard District a space that people can engage with like a public amenity. With a platform for local gatherings, such as farmers’ markets, food festivals, tree-lighting ceremonies, and pop-up shops, it’s set to become a vibrant community hub where families and friends can share a meal, enjoy a drink together, and develop lasting relationships. By energizing the town and attracting residents of surrounding communities, it will boost traffic to the downtown area and become the region’s new local destination. The piazza’s retail space will also make Gibbard District a convenient place to access local amenities. With commercial units for potential restaurants, coffee shops, grocery stores, and offices, the piazza will place everyday necessities right at the doorstep of Gibbard residents. However, it isn’t just residents who will benefit from the piazza’s retail space. For members of the public, it will be a new central location in town where they can find key retailers in the local community. By offering retail space suited to range of companies, Gibbard District’s piazza will create new opportunities for small businesses in Napanee. In addition to giving local businesses a new place to call home, the piazza will increase their visibility by placing them right in the backyard of an entire community of potential customers. Napanee businesses that find a home at Gibbard District will also be able to take advantage of their location in a town hub. Because the piazza is poised to become a destination for the people of Napanee and surrounding communities, businesses will be able to expand their local reach beyond their immediate surroundings. A vibrant hub with space for local amenities, Gibbard District’s piazza will simplify modern life, further strengthen the town’s community spirit, and create new opportunities for local businesses. Like the Gibbard Furniture Factory, it’ll bring together the best of Napanee.